As Stiyl interrogates Lidvia and Biagio in the Tower of London (er, whoever they are), Touma lands in the Rhône River, right by the Pont Saint-Bénézet. Fortunately for him, an ally is on that bridge and jumps in the drink to save him. That ally is the kind and lovely Itsuwa of the Amakusa Sect, who must change into skimpier clothes when her outfit is soaked by the rescue, leading to a couple of awkward scenes between her and Touma. 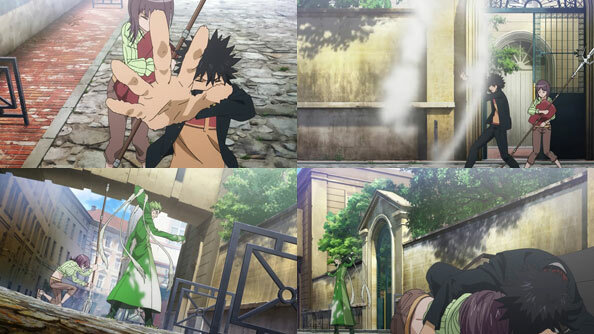 What connects Stiyl’s interrogation and Touma and Itsuwa’s advrentures in Avignon are The Right Hand of God, a group of individuals who have apparently successfully purged themselves of most of the original sin inherent in all humans, giving them some angelic powers. Touma also learns that the Document of C is officially the reason for the demonstrations. Whomever has the relic wields more power than a president with Twitter, able to mold the masses into believing whatever they say, even if there’s no proof to back it up. In this case, they are being told the Academy City is evil and the source of all their ills. 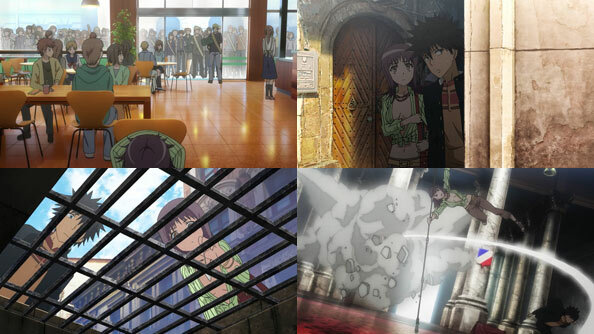 Touma teams up with Itsuwa to locate the geoducts being used to remotely control the relic from the Vatican. In the process we once again witness the unique and charming Amakusa tradition of hiding magic in ordinary everyday objects like bottled water…or underwear. Itsuwa’s attempts to render a geoduct inoperable are interrupted by a member of the Right Hand of God calling himself Terra of the Left. Despite the earthy name his attacks seem to be wind-based, but Itsuwa dodges and Touma nullifies the strikes with his Imagine Breaker. Of course, it’s the same age-old problem with Touma: his power is almost strictly defensive; he can hold off Terra but can’t defeat him. Perhaps the addition of Tsuchimikado to Touma and Itsuwa’s ranks will help break the stalemate. Lidvia Lorenzetti and Bishop Biagio Busoni are two defeated high ranking terrorists from the Catholic Church from Series 2. I thought this episode was heading back into classic ACMI style after the first episode’s rushed pace and info dumping.. I’m not sold on the new Imagine Breaker sound however. And Terra is looking a wee bit stereotypical…. If I watch the whole series I’m sure I’ll get used to the sound…but why switch it up NOW, so far into the adaptation? It’s a completely different sound! 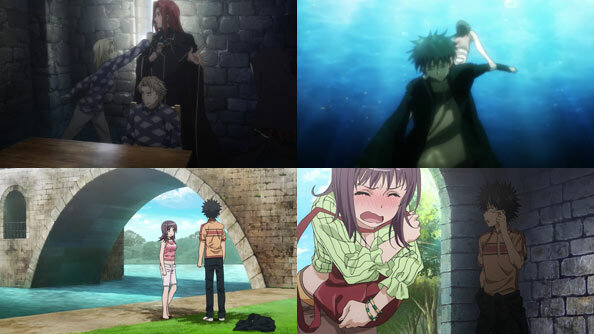 RABUJOI – An Anime Blog Blog at WordPress.com.